Enjoy the thrill of beating the wind through the Knysna Lagoon or at sea aboard one of our keel yachts. Learn basic sailing skills, tie various knots, assist in steering the yacht, handle & trim sails and learn about basic sailing skills. This introductory session is aimed at establishing if you are ready to pursue a competent crew, day skipper or coastal skipper training certificate. Meals & drinks excluded from rate. This beginners’ course focuses on practical offshore sailing whilst having fun for approx. 6-hrs a day over 2 days. Candidates learn how to become active crew members and leave with a Course Completion Certificate. By the end of the 2-days participants experience being a deckhand, assist in steering through the Knysna Heads, manoeuvring the yacht to pick up a “Man-Over-Board”, handle and trim the sails, anchor in Featherbed Bay and learn to tie a number of knots. Candidates wishing to pursue further training towards a Competent Crew or Day Skipper Certificate will receive a discount voucher. 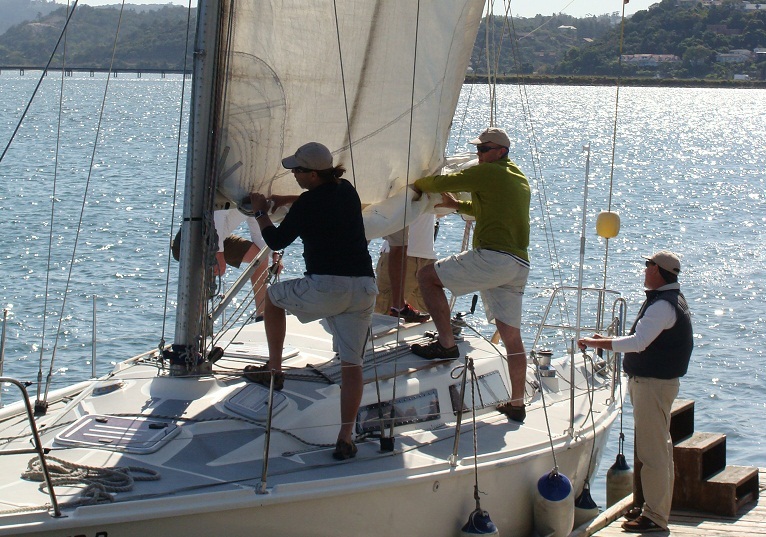 This 4 day course covers practical sailing and certain theory aspects. At the end of the course candidates should have sufficient knowledge and experience about crewing and be able to safely take control of a yacht if required. This forms the first 4 days of the full 9 day skipper course. Aspects covered include: nautical terms, knots and ropework, collision regulations, buoyage, handling a boat under power, handling a boat under sail, man overboard procedures, safety and emergencies at sea, diesel engines, local knowledge and first aid. For those with minimal sailing experience. This course includes an intense Competent Crew course plus comprehensive chartwork, navigation, day skipper training and 200nm of practical sailing, pilotage and navigation around Knysna. Upon successful completion, students receive SAS Day Skipper Course Completion Certificates. In conjunction with a VHF radio license, 200nm (including 2 night hours) and an eye test, the successful student may apply for the SAS Day Skipper’s license from South African Sailing. This license qualifies the holder to skipper a (sail & power) yacht offshore 25 miles from a safe haven or inland during daylight hours. Rate includes course fees, learning materials, practical sailing; excludes external assessment and SA Sailing exam fees. A marine DSC/VHF radio licence is issued by SAMSA to successful candidates of the two-day Short Range Certificate (SRC) course and exam; which includes both answering multiple choice questions and a written knowledge test followed by a practical demonstration of practical skills operating a marine DSC/VHF radio. Examinations are scheduled in Knysna on the second day of the programme. An additional exam & licensing fee of R 690.00 is due to SAMSA 7-days in advance. To operate a power vessel less than or equal to 9 meters in length and with an engine larger than 15hp (jet skis included) on dams, rivers, sea and in harbours in South Africa, a SAMSA skipper license is required. www.skippercourses.co.za offers online tuition towards achieving various levels of powerboat ONLY skipper licenses and then links candidates to a network of SAMSA approved examiners in Knysna and also around the country. The mileage builder includes 4 days practical local sea time logging minimum 200nm, 20 night hours and 1 night entry sailing into a local Port (Knysna, Mossel Bay or St Frances). During this time you will get familiar with the keel yacht you will use for the exam; you will practice all the sailing activities required of you for the exam and you will revise all the sailing terminology, vessel parts and the knowledge required for the oral component of the practical exam. The SAS Coastal Skipper license entitles holders to skipper a yacht within 40nm of the coast by day or night. Practical requirements are 800nm, 24 night hours on duty and 3 passages of at least 60nm. The 4-day theory plus 3 days practical training prepares candidates for the COLREGS/IALA Exam, the SAS Coastal Chartwork Exam and the SAS Coastal Practical Exam. (Exams take place on 8th day). 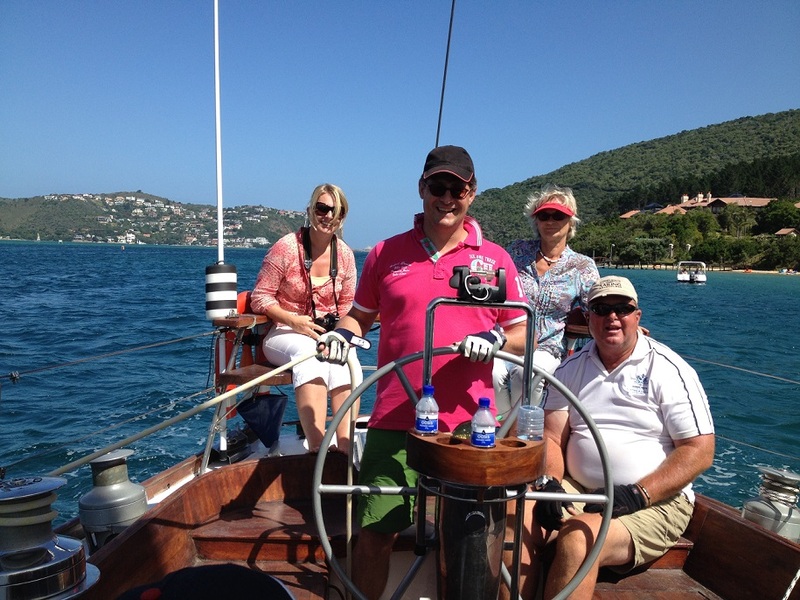 Rate includes course fees, learning materials and max 3 days sailing; excludes external SA Sailing exam/assessment fees. Gain superyachting experience from our professional team of skippers whilst getting qualified and prepared to work overseas! Explore the adventures and rewards of being a working crew on luxury superyachts; and earn EUR or US$! The minimum recommended qualification requirements of international superyacht captains and charter operators covered in our Superyacht Programme includes: Basic Safety Training (STCW 95 Basic Safety Training Certificates), SAS Day Skipper (Sail and Power) License, RYA Power Boat Level 2, RYA Personal Watercraft - Jetski License, Marine DSC/VHF Radio License. Rate includes course fees, learning materials, practical sailing/boating, assessment & certification. Self catering accommodation (out of season) in Knysna is available at additional R 295 pp/night. Note: RYA and STCW Courses are offered in Cape Town; subsistence & travel is not included in the rate.